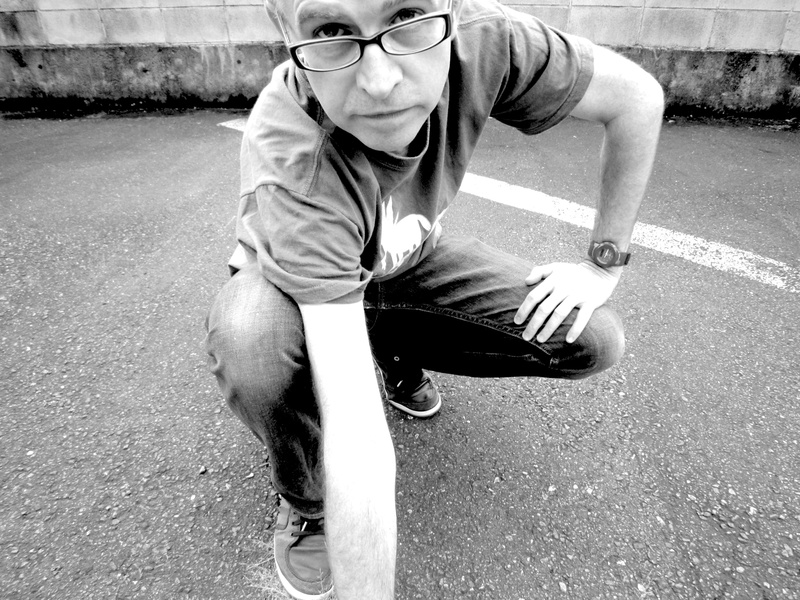 Born in Melbourne, Andrez Bergen is an expatriate Australian author, journalist, DJ, photographer, pretend saké connoisseur and hack musician, who has been based in Tokyo 東京, Japan, over the past 14 years. He makes hack tunes as Little Nobody and Funk Gadget. Aside from specializing in Japanese culture, anime, movies, and electronic music’s various tangents for magazines like Geek (USA) and Impact (UK), along with newspapers The Age and the Yomiuri Shinbun, Bergen has written fiction for Another Sky Press, Shotgun Honey, Snubnose Press, Perfect Edge Books, Pulp Ink, Solarcide, Roundfire Fiction, Big Pulp and Crime Factory. After doing a book of prose in collaboration with famed Polish photographer Tomek Sikora, he released his debut novel — the noir/sci-fi-inclined dystopia that is Tobacco-Stained Mountain Goat — in 2011. Bergen published a second novel, One Hundred Years of Vicissitude, in 2012, his third (Who is Killing the Great Capes of Heropa?) in 2013, fourth one Depth Charging Ice Planet Goth (2014), and #5 Small Change (Dec. 2015). In 2013 the accidentally busy sod also put together a collection of short stories, articles and comic stuff (The Condimental Op), a series of comic books (Tales to Admonish) and edited an anthology (The Tobacco-Stained Sky), while 2014 saw 12-issue comic book Bullet Gal, and 2015 comic series Trista & Holt. He’s currently working on sixth novel Black Sails, Disco Inferno, as well as on a comic series called Magpie with veteran Australian artist Frantz Kantor for Oi Oi Oi! zine. On the side? Occasionally working on translating and adapting the scripts for feature films by Mamoru Oshii (Ghost in the Shell), Kazuchika Kise and Naoyoshi Shiotani, for Production I.G. Bergen also runs IF? Commix, used to run indie/experimental record label IF? Records for 14 years, he is married to Japanese artist Yoko Umehara, and they have a daughter, Cocoa. Hi Andres I’m a reviewer. I sent the below message to Maria, your publicist–but it came back via Demon–Mailer. Hi I am Laurence Coven a Freelance Reviewer who reviews for Sally Powers who publishes I Love a Mystery. She told me about you book “Who is Killing the Great Capes…” and I am intrigued by it. But I never review anything in Digital or Kindle or any of that stuff. But if you like you can send along a hard copy to Sally Powers or to me directly at the address below.–Feel free to keep me on your reviewer’s list–but again, orly for hard copies. Much thanks. Laurence Coven . Sadly, since I’ve tried several times–this will be last chance to contact anyone about this as I’m have quite a few other reviews to work on. Laurence, cheers for your message and I’m glad you’re intrigued! 😉 I’ve forwarded on your request to Maria @ JHP (I think there’s one R too many in her email address in the mail-out she did, which accounts for rebound… sorry about that. Stay tuned. Heya Andrez. I just found one of your books on Good Reads. I’m Australian and have spent some time in Japan. Birthday is 13th December. The coincidences encouraged me to say hello. Hello! Also an author and reader, and I can’t wait to check out your work.